Its been a busy few weeks for our sail trainee Mark. Earlier in the month I met with Mark at Sunderland Civic Centre where final preparations for the Tall Ships Race were taking place. Sail Trainees met with their sponsors and got their kit list for their journey to Esbjerg. 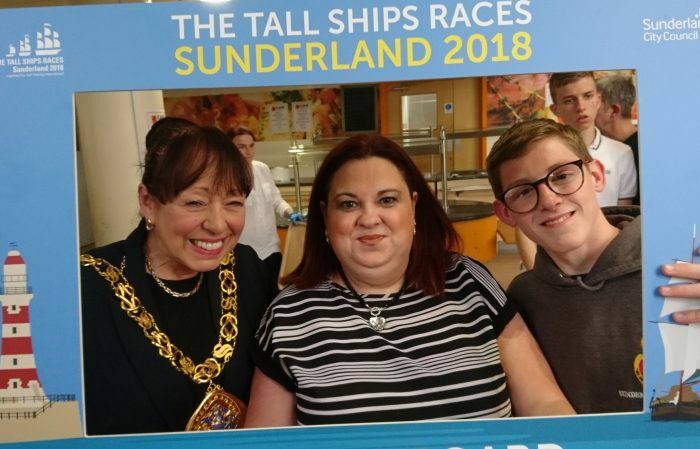 The event was hosted by the Mayor of Sunderland, Lynda Scanlan and members of the Yacht Club. The trainees learned all the terms they would need on board and were given their Tall Ships T Shirts for the voyage. After photos and presentations, they had the chance to meet with other like-minded trainees and take selfies with the tall ships picture frames while enjoying tea and cake. Mark and I were lucky enough to meet the Mayor and talk to her about the voyage and our sponsorship. 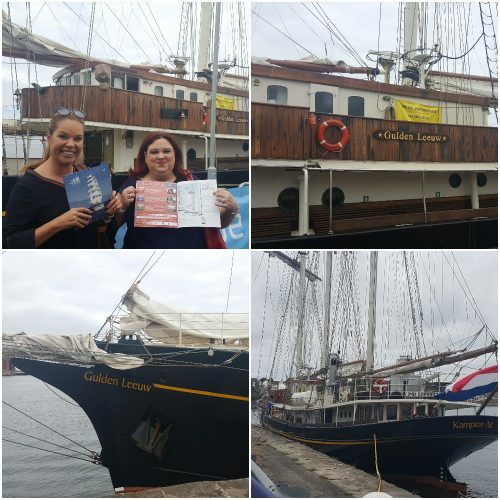 She admitted to us that she was a little bit scared of her trip on a tall ship but thought that it was a fantastic opportunity for any young person. Once the Tall Ships were in Port I took a trip to down to the berthing area to search for the Gulden Leeuw which Mark will be sailing on. It was amazing to see some of the finest international ships in Sunderland and enjoy the events and celebrations taking place. We went on board the Santa Maria Manuela and became Captains for the day. Mark has truly taken the opportunity to challenge himself to be part of this adventure of a lifetime as he sails across the North Sea to Denmark. He left on the Gulden Leeuw on Saturday evening as the Parade of Sail left the port and headed out to sea for the first part of the Tall Ships Race. We have been following the ship on the marine tracker and look forward to hearing all about his adventure when he returns. Our story was also featured in the Sunderland Echo.